There’s no doubt that farmers have many challenges ahead of them, particularly in keeping up with new environmental requirements and developments in technology. And it seems that almost every week, some new research emerges that makes us rethink some of our farming practices. The past few weeks are no exception as a new study by Aqualinc and the Fertiliser Association of New Zealand has highlighted how irrigation can be adapted to reduce nitrogen losses. This has the potential to help farmers and growers significantly reduce their environmental impacts. The study showed that on 12 Canterbury dairy farms, an average of a 26% reduction in nitrogen losses could be achieved through changing when irrigation was applied on the farms. Many irrigators now have challenging targets in their Farm Environment Plans to reduce their nitrogen losses. And where these targets are not yet in place, the new government has signalled they would like to see them introduced in the future. The message for farmers from the study is that how you manage your irrigation in early spring and autumn has a big impact on your overall nitrogen losses. In wetter, cooler conditions, there is more risk of nitrogen leaching through soils, as pasture growth is slower so you need to adjust your irrigation as result of this. In practice, we recommend that farmers should look at not irrigating in September or April, as the nutrient losses may outweigh the benefits of some additional pasture growth. Very dry years would be an exemption to this rule and soil moisture monitoring technology will help you identify how dry the soil actually is. In October and March, we recommend not irrigating as often as in the height of summer and allowing soil moisture levels to drop to around 40% – lower than the 50% level recommended in summer. Given that the nitrogen loss reductions made in the study were significant, we would like to see further research undertaken on how to adjust irrigation for different annual climate conditions. Overseer modelling simulates conditions in an average year, but we know that variations in rainfall and temperature affect growing conditions and irrigation use every year. 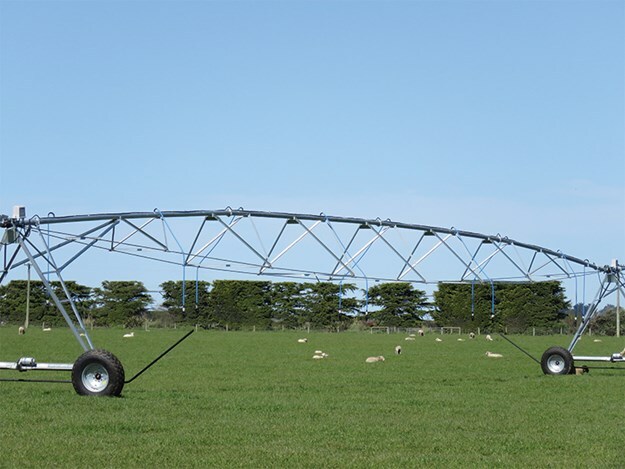 IrrigationNZ carries out training courses and we recommend that irrigators adjust their irrigation in spring and autumn to apply water less often to reduce nutrient losses. The new study provides evidence on the value of altering irrigation patterns in the shoulder season and the reduction in nutrient losses that this can achieve. weather forecasts, and how to schedule irrigation appropriately. The new study highlights how the careful management of irrigation systems can make a significant difference to a farm’s environmental footprint, so it’s definitely worth investing some time to understand how you can best manage your irrigation. IrrigationNZ covers different aspects of irrigation management in regular training courses. For information on upcoming training opportunities, visit irrigation.co.nz.